Now the surprise is, that it is lighter. 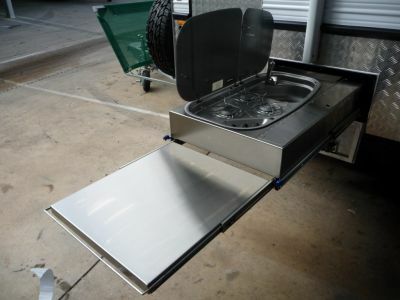 Our van weights have been creeping up, with more and more new equipment added on year to year. Even with a full package of Optional Equipment added on, about 400 kg of gear or more, in 20' this layout is back to our old weights of 2500 to 2550 kg for a 20'. This is primarily a consideration for tow vehicles like a Toyota, when you want a lot of water tanks and a lot of gear on board. Weight can be a problem when you really want to load one up on your upper limits. For sure, the best advice is to see them in person here. The rear ensuite has proven to be the most popular layout trend of lately, and this weight savings is another positive feature to consider. So are we - once we get the van even happier. GMC Sierra & Bushtracker What a great piece of engineering. 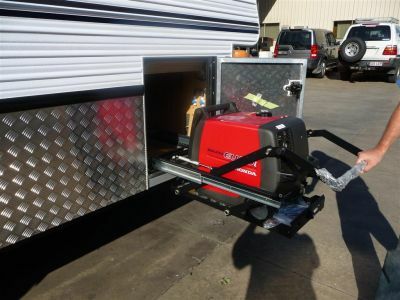 And on the other side another big hit at Show, that will be at the Brisband Show as well in June, is a roll out and drop down generator mount. 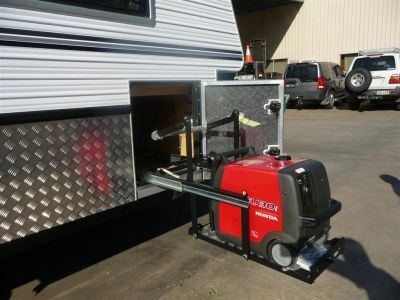 This Honda 3 kva, with this low loader, is proving very popular. 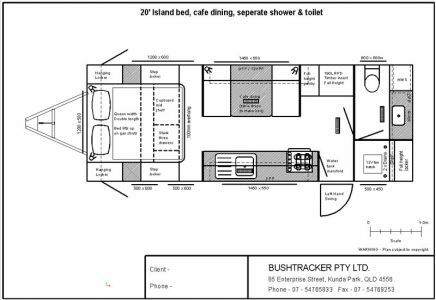 This layout and pictures looks like the 20' Bushtracker at the Brisbane caravan Show that Marion and I were quite taken with. Were there any of you that were impressed as much? We are not sure we have seen a better layout. We do not think we need the expense of the outdoor slide out kitchen, one kitchen is enough. And if we do away with the 3 kva and go to a 2, we do not need that drop down slide out mount. Just these two items, of a bit too much luxury, brings the price down quite a bit and makes this layout and size very attractive. Can anyone offer criticism or advice to improve it further? All comments would be welcomed. 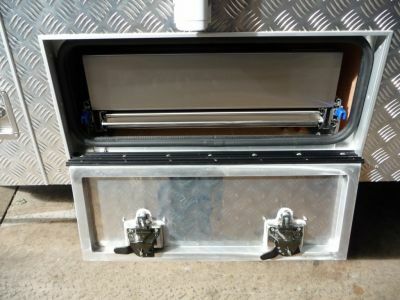 Couldnt see the sense in the extra weight/cost/limitations etc of a slide out stove system. We have since bought a teeny Weber "Baby Q" to use on gas anywhere outside the van. Got it for $118 delivered using Mastercard points. Rave reviews everywhere. The generator slide out takes/locks up some space, so we didnt get that either. We carry a 3Kva (eBay), but feel we will very rarely use it. No rear window. The side windows in the bathroom are enormous and allow plenty of light in. The four seasons draws the air through beautifully if required. We also chose to reverse the opening side of the shower door itself, so someone can still stand at the basin, whilst another is getting out of the shower. 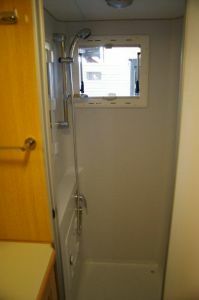 Less risk of damage to the glass shower door if a cupboard or drawer is accidentally left open,too. Doesnt seem so tight to get in either. Just watch that weight.... we are in the process of dieting. We have 33"muddies on the 100series, and chose the same for the van - doesn't help that cause..
Hope this helps with your planning. "the scruB ark".... on The Way. 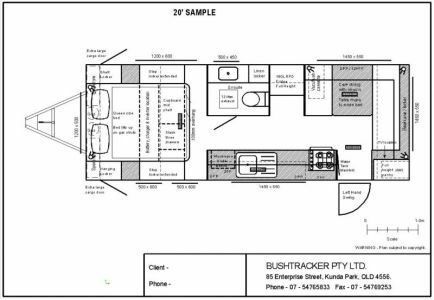 We are approaching the design stage of our 20ft Bushtracker and have decided on the rear ensuite together with the popular layout but are undecided on a front or rear door, this will be our first van so we have not experienced either. Apart from coming down to a personal choice we would really appreciate any feedback as to advantages/disadvantages for each location as no doubt there would be many we have not thought of. We have a front door. The advantage is that you gain about a foot of bench space on the passengers side. Disadvantage is that when you open the door you are looking at the bed. We don�t invite people into our bedroom at home! 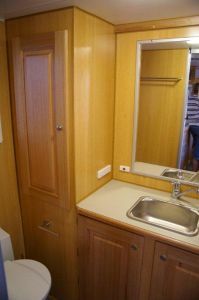 Therefore our choice of layout reflected that with a rear door entry, rear dining/lounge and central ensuite which in essence gave us 3 separated areas: bedroom, kitchen, entertaining/living ...and privacy as we also went for a privacy curtain which can close off the bedroom. It also gave us a much longer kitchen bench area which my wife wanted with a massive amount of cupboard space thanks to the way Phil did the kitchen area for us. We also had each of the kitchen ends modified so they did not cut in as is done traditionally, but went straight down before curving out to follow above the bench top profile. That also gave privacy up into the van if someone just stood on the steps to chat. But, we understand that design/layout/preference is personal. All the very best with what you go for. Life can be hard���...but a BT makes it all fun! Appreciate your reply and comments, certaintainly is a lot to think about, we intend to live in our van travelling full time so need to get it just right. 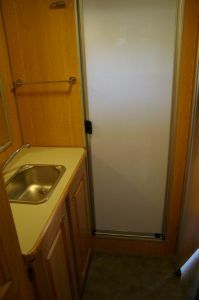 Thinking the rear door may be the way to go for us, still unsure on the hatch over the bed and washing machine location. Hi krisandkev, this is Paula, good to hear from you. 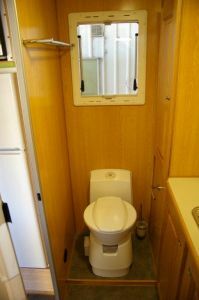 Graeme is not keen on the hatch where as I am, would you have it again if you were ordering a new van? Does it let too much light in at night? Does it allow bugs in? Do you have the front entry or back? Iam wondering with a back door entry would it be too dark without a hatch? Hi Paula, Robyn here from RobandFlip. 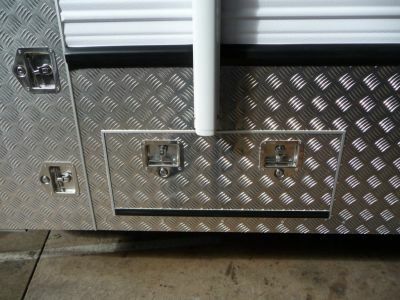 We have the rear door and the hatch over the bed. The hatch is great for light, however, it becomes very hot when the blind is open and I prefer not to have the bedding sunbleached. We rarely open this hatch because the windows do a great job of creating cross breezes and because of the excellent ceiling insulation, hatch and blind are closed in the heat of the day. 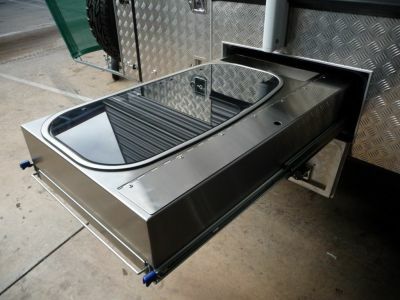 I am not sure if Bushtracker offer a smaller hatch for over the bed but I would explore that option if buying again. OH DEAR!! desicions decisions... 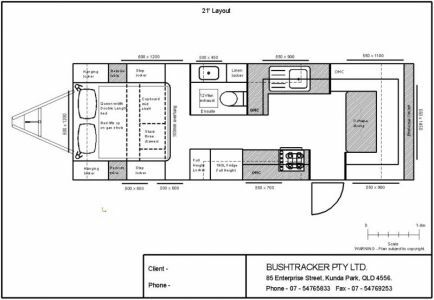 Thanks Robyn, Kris and Kev, we are flying to Maroochydore at the weekend and finalising our layout on Monday, we are so excited and I wouldn't be as concerned about the design if it wasn't for the fact of us eventually living in our BT. Kevin your trip sounds fantastic..hopefully we will hear more of your travels as you go. I found a USB adaptor on eBay that fits into that round 12v socket above the table. Plenty of merit to cig lighter adapters available along with double usb chargers to suit from places like Jaycar and auto stores. Much more efficient than using inverter and 240v charger!! We went for the Dometic Skylight over the bed and would get it again given a choice. Aside from ventilation ect., a valuable aspect is it allows me to inspect the roof top from the bed without carrying a ladder, to see the condition of the solar panels �..and anything else I need to. We overcame the minor issue of heat by buying a roll of �Aircell Retroshield� from Bunnings (some Bunnings still carry a 6mtr roll for around $108) which we cut to fit above the Skylight blind and reflect any heat, as it is recommended not to travel with the blind pulled across. We also use it for under the glass on the Sunroof of the LC200 VX ��.as we never wanted a sunroof but cannot option it out. 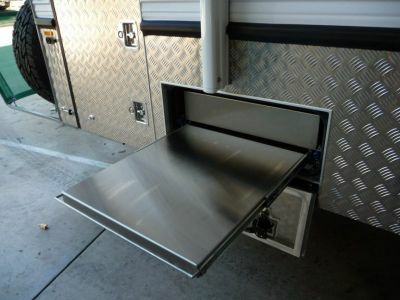 Additionally, we have cut lengths to fit into all windows of the van for heat reflection for when it is parked at home. It fits in nicely if you cut it to the proper size of each window so it can slot into all 4 sides of the window channel. Seeing as how your intention is long term living in the BT, suggest you might want to have separate Sirocco fans installed for both sides of the bed and elsewhere in your van. 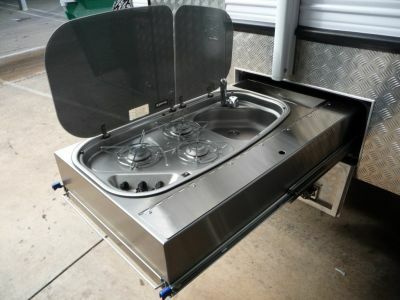 In addition to the bedroom, my wife wanted one at the other end of the van that could be directed into the kitchen and dining/lounge, which we have found invaluable. Small price to pay for initial build as against �sighing� later on. Talk with Phil as there will be some things that once you leave BT HQ, you can add/adjust during the initial sage before full blown construction starts. The large Dometic Skylight over the bed, is a major success story. We would not build a Show Van without it. Instead of worrying concerns about the heat it lets in? It lets a lot of heat out and when you open it up on a warm day it brings in a lot of air through the windows on marginal days so you do not need air conditioning. It is magic on the rare nights of clear sky when it is a full moon, starry night, that sort of feeling. I would say that about 90% of all Owners that have it would have it again OK? I have to step in on the Owners commentaries, if I feel it is unbalanced. The problem with a Forum is sometimes the response will only be three that might complain about something, and they might only be five out of a hundred. I have to make sure the view is balanced so those in the indecision range hear the greater picture OK. I will try and balance the view, and in this case since I am the hub of information for the thousands, it is a 90% in favor case.. There is one in my own new van. My Office Manager Matthew has had one in every Bushtracker he has had, and would not go without it..
Kind regards, Steven Gibbs, Director.